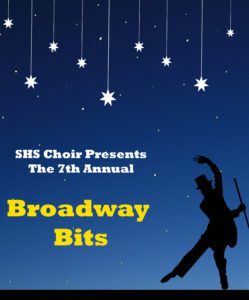 Broadway Bits is an exciting show of Broadway songs performed by Sherwood High Choir students. Vote for your favorite acts and help the students raise money for the choir. Due to popular demand, this year the show will have TWO performances: Thursday, January 31st and Friday, February 1st at 7:00pm in the Performing Arts Center of Sherwood High School. Each ticket to the show comes with 5 vote tickets. Additional vote tickets will be sold at the show for $1 each. While an Audience Choice award will be presented both nights, awards from our judges will only be presented at Friday night’s performance.